The U.S. labor force didn’t reach expectations and only slightly expanded during April: according to the recent U.S. employment report, which was published today, May 4th by the Bureau of Labor Statistics the number of non-farm employees rose by only 115,000. The main sectors that expanded during April were in professional and business services, retail sales and health care but declined in transportations and warehousing. The rate of unemployment edged down to 8.1% – the lowest level in recent years. The chart below presents the revised figures of the number of non-farm employees added to the labor market during the past couple of years (up to April 2012). The change in number of non-farm employment was the lowest in the past six months. 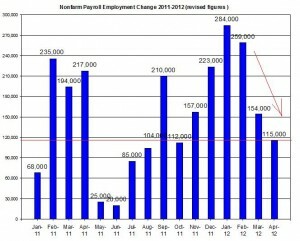 Furthermore, the change in non-farm payroll was revised up for March from +120k to +154k. As I have calculated in the past, the number of non-farm payroll employment needed to join the labor market on an average monthly scale to keep up with the growth of the U.S. civilian labor force is at least 107,000 (see red line in the chart below). 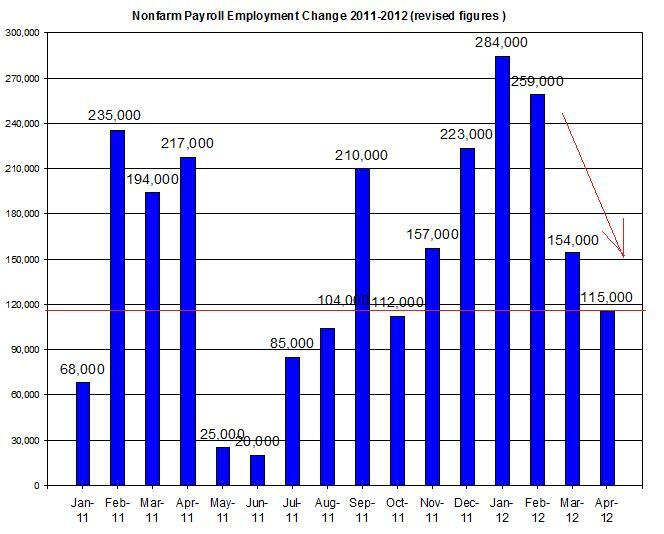 This means that the increase in employment during April reaches this number but just barley. This is a sharp drop from the big numbers we got used to between December 2011 and February 2012. 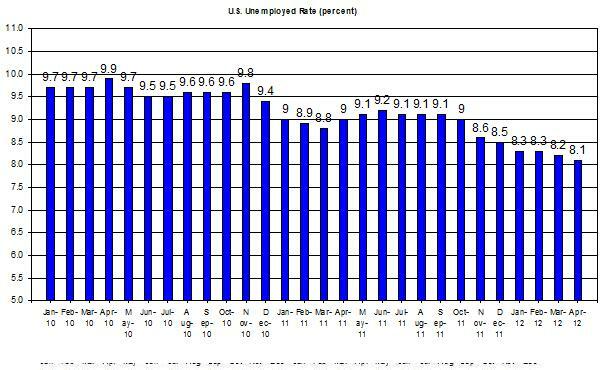 Following the rise in employment the rate of U.S. unemployment edged down tot 8.1%. The rate of unemployment is still at its lowest level in recent years as seen in the chart below. 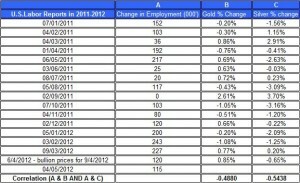 The current unemployment rate is 1.7 percent points lower than its rate in November 2010. Furthermore, the number of unemployed persons (12.5 million) slightly declined during April. As I have already reviewed in the May gold and silver prices monthly report, historically, as the non-farm payrolls didn’t rise above expectations gold price tended to increase; this correlation was mostly due to the effect this news has had on the U.S dollar; the news of the small gain in the U.S. labor force during April could consequently help rally gold and silver prices. 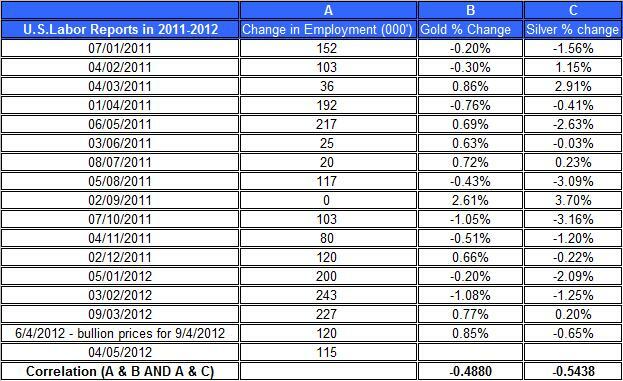 The table below presents the correlation between the news of the U.S. non-farm payroll employment changes and the daily changes in gold and silver prices on the day of the U.S. labor report publication. 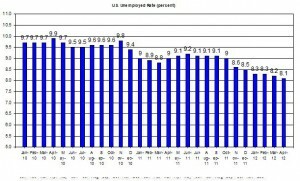 The modest growth in the non-farm employment isn’t a positive signal for the progress of the U.S. economy in regards to its work force; thus this news may also reflect an expected decline in U.S. demand for crude oil, and consequently may adversely affect crude oil prices during today’s trading.